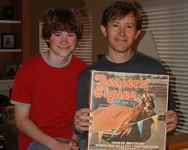 That's me and my son Sam holding one of our favorite "vintage" board games, "Dealer's Choice," a used-car trading game from the 1970s. PLAAY Games is ME, Keith Avallone! It's a little e-business I created in the year 2000 to give me an outlet for the old-fashioned card-and-chart sports board games I have a passion for creating, playing and sharing! I grew up in the 1960s and '70s and have always loved games. I started making my own games--versions of Monopoly and "The Game of Life," along with various card and quiz/trivia games. I discovered professional sports at age 10 and soon began playing sports board games from companies like APBA and Strat-O-Matic. They quickly became my number one interest, and it wasn't long after that I began tinkering with my own sports board games. I've been tinkering ever since, it's been a life-long passion! PLAAY Games is built on integrity and a high level of customer service. Sports board games are my passion and I truly care about the people who play them, whether they purchase a game from me or not! I have been on the "customer" end of buying games myself, and I treat people the way I want to be treated. That means prompt processing of orders, assistance with any questions, and products that are a good value. EACH GAME CREATED TO BE PLAYED SOLITAIRE! One problem I've always had as a sports board-gamer is finding other people to play! So, I created ALL of these board games so that I could play them WITHOUT needing an opponent! That's an important distinction--many sports board games are designed first for head-to-head play, with added-on rules for playing solitaire. PLAAY Games are put together the other way around! They are designed FIRST for SOLITAIRE play, with added rules for head-to-head competition. "WHAT ABOUT THE GAMES THEMSELVES?" The idea behind all PLAAY.com sports simulation board games is to provide the same kind of experience you'd get from reading a good novel. Every game is designed to make you feel like you're "watching" the game or event unfold before you. Add your imagination, and all of a sudden simple words and numbers printed on cards and charts are transformed into vivid, exciting, often dramatic sports action! Use teams or athletes from the past, and it's like a sort of sports time-machine! It's important to draw the distinction between sports simulation board games, and sports strategy board games. Strategy games re-create sports strategy, simulations re-create sports results. Our games are solitaire simulations first, with strategy elements added for head-to-head play. So, they can easily be enjoyed BOTH ways! PLAAY games are imaginative, but not fancy. All games are printed on good quality paper products, and we introduced color graphics to each of our games in 2009 after ten years of nothing but simple black and white print. In 2015 we switched from the fold-flat "shirt boxes" with "some assembly required," to bona-fide, custom-manufactured two-piece game boxes. "WHAT IF I BUY A GAME AND DON'T LIKE IT?" We offer a 30-day money back guarantee on all our products. However, please make your decision to return a game before you have played it. Simply return the product within 30 days in re-sellable condition (cards not separated, etc.) and we will refund your money. **"APBA," "Strat-O-Matic," "Avalon-Hill," "Basketball Strategy," "Monopoly," and "The Game of Life " are all registered trademarks of their respective companies.